You must be a member of the Singapore Obstacle Course Racing Group to attend this activity. Would you like to join this group? 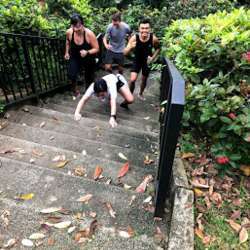 Stair Climb with Exercises to build up strength and endurance for tackling hills. First timers are more than welcome! The route is very short (we will be doing repetitions) and there are taxi stands if you wish to end the activity earlier. NOTE: In the event of wet weather, activity will be cancelled. updates will be provided at 7AM.